A website with online offers helps the teachers of language courses to use Chromebooks in their lessons. August 2017. Language teachers of the non-profit educational institution Berlin-Brandenburgische Auslandsgesellschaft (BBAG) did not use laptops in their classes before their participation at Project Reconnect. However, in their language courses "German as a foreign language" and in their integration courses for refugees, they use computer-assisted learning, for which they use the donated Chromebooks. The team of BBAG therefore wanted to support their teachers dealing with this task. A website with a wide range of online learning offers has been compiled. Every teacher should find something to use in his class. The website was called "help for self-help". In addition to the website, BBAG also offers training courses for the course instructors, which are evaluated by the participants. The results help to develop the offers. 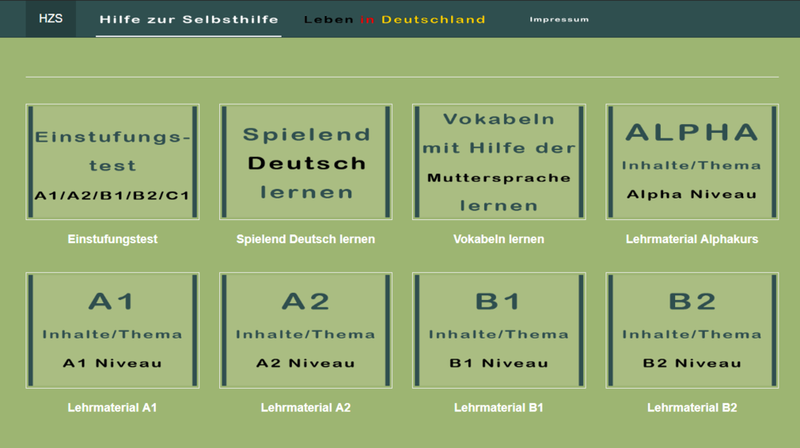 The landing page of "Hilfe zur Selbsthilfe" shows an overview of the language learning offers. “For us, it was important to provide a link list by level”, explains Kilian Kindelberger, the chief executive of the non-profit educational institution. So, there are learning materials for literacy courses, as well as for German courses for beginners and for advanced students. Through other links, students can learn the German language playfully or practice vocabulary. All offers are free and do not require registration. This was also very important for Kilian Kindelberger. The teachers were very happy about this link overview - and they use the Chromebooks more and more in the classroom. The fact that the decision to set up the website was the right one is also shown by the results of the students. "If the Chromebooks are used in the course of the integration courses, a noticeable improvement in the progress of the German language can be seen," tells Kilian Kindelberger. To access the website and to get an overview of the different offers, you do not have to be a teacher of such courses teaching German as a foreign language. "Hilfe zur Selbsthilfe" (help for self-help) is also aimed directly at all interested learners of the German language.